Soprano Cristina Nassif is acclaimed on the operatic and concert stage for her "powerful, expressive voice and electric stage presence” (The Washington Post on her Vitellia with Washington National Opera). 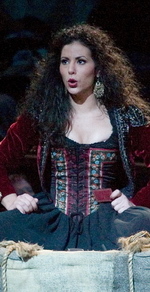 In roles that include Violetta, Musetta , Rosina, Vitellia, Donna Elvira, Countess Almaviva, Susanna, Tatiana, Santuzza, Nedda as well as Carmen, critics have praised her versatility as singer and actress. In concert, she has performed Mahler’s Des Knaben Wunderhorn, Strauss’s Four Last Songs, Berlioz's Les Nuits d’ Eté, Mendelssohn’s Elijah and Lobgesang, Pergolesi's Stabat Mater and Beethoven’s Ninth Symphony, among other works. Internationally she has performed Bizet's Carmen in London at Royal Albert Hall and the O2 Arena as well as in South Africa at the South African State Theater in Pretoria and the Civic Theater in Johannesburg. She has also been a Featured Artist performing in solo recital at the Al Bustan International Festival in Beirut, Lebanon and as Soprano Soloist in the Festival's presentation of Verdi’s Requiem. Additionally she was a soloist in concerts performed in China's Shanghai and Shenzhen Concert Halls through the International Opera Alliance. This February she presents So This is Love, a concert featuring selections of love songs and arias at St. Mary's Episcopal Church in Ardmore, PA. In May, Ms. Nassif will return to the 12th Annual River City Festival of the Arts, continuing her tradition of bringing music to her father's hometown in West Virginia. Ms. Nassif has performed leading roles with the London Royal Philharmonic, Opera Africa, the Washington National Opera, Opera Delaware, Opera North, Central City Opera, Opera Theater of Pittsburgh, Opera Tampa, Shreveport Opera, Piedmont Opera, Opera New Jersey, Wichita Grand Opera, Virginia Opera, the Allentown Symphony and the Opera Camerata of Washington as well as in concert with the Shanghai Opera Orchestra and Shenzhen Symphony, Lebanese National Orchestra, Virginia Symphony, West Virginia Symphony, Buffalo Philharmonic, McLean Symphony, Eclipse Chamber Orchestra, Pittsburgh’s International Poetry Forum and Philadelphia's Lyric Fest. She has performed in London's Royal Albert Hall and O2 Arena, China’s Shanghai and Shenzhen Concert Halls, the South African State Theater in Pretoria and Civic Theater in Johannesburg, Carnegie Hall's Weill Recital Hall and Zankel Hall, the George Washington Masonic Memorial, the Kennedy Center's Opera House, Concert Hall and Terrace Theater, Pittsburgh’s Carnegie Library and D.C.'s Lisner Auditorium and Austrian Embassy, among other venues. Of Spanish and Lebanese descent and the daughter of two musicians, Ms. Nassif began her vocal training with her mother, mezzo-soprano Cristina Herrera de Nassif, and the two have shared the concert stage with her father, a retired Air Force physician and pianist, Dr. Thomas Nassif. She earned a Bachelor of Music degree from the University of Maryland and an Artist Diploma from The Academy of Vocal Arts in Philadelphia.